Contrary to how it may appear on this site, I do eat food other than baked goods. Sometimes. My biggest problem with cooking, especially with cooking dinner, is that I run out of patience. I have a hard time putting all the ingredients together and then waiting for it to cook while I stand by getting hungrier and hungrier. By the time it’s done I’m so ready to eat that there’s no stopping for photos. Well, most of the time anyway. Last week I made one of my favorite Giada De Laurentiis recipes and took the extra minute to photograph it because it looked so pretty. Also, I wasn’t quite starving yet. This is one of my favorite week night meals because it’s quick, easy, and packed with flavor. The sauce comes together in minutes and the slight sweetness of the sun-dried tomatoes is a perfect compliment for the tangy goat cheese. Paired with a green salad and some fresh garlic bread, this pasta dish is even nice enough to serve to your guests. While this recipe isn’t complicated to begin with, I take a few shortcuts to make it even easier: I purchase my sun-dried tomatoes julienned (so I don’t have to mess with chopping them) and my goat cheese pre-crumbled (because I’m lazy). 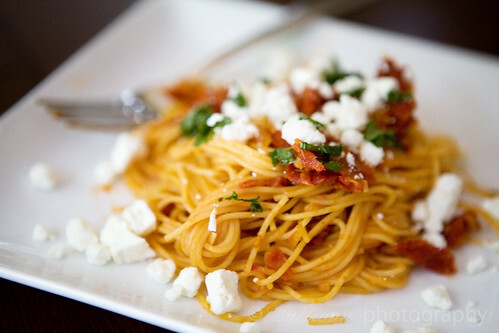 You can use spaghetti or any other shape of pasta you have on hand, but I prefer the short cooking time and lightness of the angel hair in this recipe. Bring a large pot of water to a boil. Add a handful of salt, then add the pasta and cook until al dente, usually between 4 and 6 minutes. Saute the onion in 2 tablespoons of the oil from the sun-dried tomatoes using a large skillet over medium heat. Once the onion is tender, stir in the garlic and saute until fragrant, about 1 minute. (Be careful not to let it burn!) Add the tomato paste and cook for about 2 minutes, stirring constantly. Add the wine and whisk until combined. Add the sun-dried tomatoes and simmer for a few minutes until the liquid has reduced by half. Salt to taste. Once al dente, remove the pasta from the boiling water (reserving the water) and add it right to the skillet. Toss to coat. If the sauce seems dry, add some of the pasta water to moisten. Sprinkle with goat cheese and basil. Toss and serve. But seriously, I love this blog. I have it filed under ‘favourite food blogs’ – a privileged slot indeed.